Home » edgar allan poe , history , holidays , leepoeking day , martin luther king jr , robert e. lee , united states » Happy LeePoeKing Day Weekend from The Knight Shift! Happy LeePoeKing Day Weekend from The Knight Shift! First, born on January 19th in 1807, there is Robert E. Lee: to this day one of the most revered and beloved generals in American history. And in this blogger's mind, also one of the greatest examples of Christian virtue and service. Eventually Lee had to make the hardest choice of his career: to lead the Union army or to throw his lot in with the Confederacy. As we all know Lee became the general of the Army of Northern Virginia. But what choice did he have? Lee was morally unable to take up arms against what he considered to be his countrymen. His role in the war and even his personal character have been debated for years... but in my mind there is no grounds for debate. Robert E. Lee simply sought out to do what God would have him do, as best he could understand Him. How many of us say the same about ourselves? 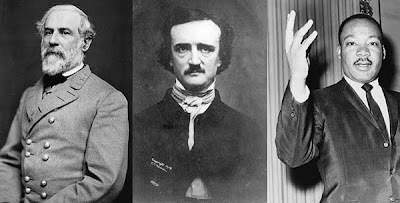 Born on the same day two years later was Edgar Allan Poe: the father of the detective story and the one most credited for developing what became the modern horror genre. Poe's influence is still considerable today, especially in literature and film. Unfortunately his later literary success did not reflect his life: Poe's years were wracked with personal tragedy, including the early death of his young wife. He died in Balimore, Maryland at the age of forty, leaving behind such works as "The Raven", "The Cask of Amontillado" and "The Masque of the Red Death". And on January 15th, 1929 in Atlanta, Georgia was born Martin Luther King, Jr.. Interesting historical note: King was originally born "Michael King Jr." until his family visited Germany in 1934. So inspired by the life of Martin Luther was the elder King that he legally changed both his name and that of his son. Martin Luther King Jr. was in the church choir that sang at the Atlanta premiere of Gone With The Wind in 1939. He entered college at the age of 15, became the pastor of Dexter Avenue Baptist Church when he was 25, and earned his doctorate the following year. The rest of his life, of course, was devoted to the civil rights movement and the dream of a nation whose people "...will not be judged by the color of their skin but by the content of their character." So wherever you are, and whoever you might be, HAPPY LEEPOEKING DAY! Dr. M.L.King was born Jan. 29th?